There are a lot of angles to use when handicapping a horse race: trainer angles, jockey angles, pedigree angles, track surface plays, shippers, bias statistics, and speed figure patterns are some of the more popular, but chances are, if it's in the past performances then someone somewhere has a betting angle for it. In many ways, that was the impetus for Gary Hall to develop his ALL-Ways software, which uses multiple regression analysis to handicap a race based on 87 different factors. It's an approach I can appreciate because I rarely focus on only a few angles. 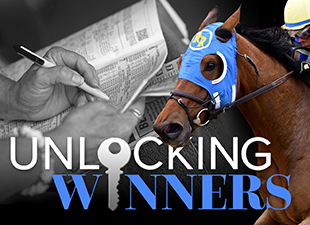 Yes, I look at individual data points and upgrade (or downgrade) a horse's chances based on each piece of information, but overall I would describe my handicapping as working hands on with all the pieces of the puzzle before stepping back to look at the big picture and determine the odds of each horse winning. But what size puzzle is best for the modern horseplayer? The mantra "thing long, think wrong" is something I try to keep in mind when pouring over a particularly inscrutable race. There is a lot of information available in Brisnet.com handicapping products such as the aforemention ALL-Ways software or even the Ultimate Past Performances. Is digesting all of it essential to good handicapping? Pedigree, for instance, becomes a total nonfactor when dealing with lifetime $10k claimers who have only ever run six furlongs on conventional dirt and are doing so today. That's an extreme case, but it illustrates the point. And if we can eliminate some factors then can't we boost the importance of others as well? This was a question I had asked myself before, but handicapping the recent Keeneland meeting forced me into an answer because I found myself thinking long (and too often wrong) about competitive races. I've been handicapping races long enough to know there's no oracle or smoking gun, but I also know that a race itself hasn't changed that much through the years, and that lead me to remember something both Len Ragozin and Andrew Beyer wrote about in their books The Odds Must Be Crazy and Beyer On Speed, respectively: the single-most powerful handicapping data point at their disposal was the last-out speed figure (Ragozin data for Len, BSF for Andy). The universal availability of speed ratings, performance figures, and the like has zapped most of the value from this "angle", but in terms of identifying likely winners it's still important. I put "angle" in quotes earlier because--to me--determining the fastest horse in a race isn't an angle, it's the essence of handicapping, but zeroing in on a single figure--particularly the last or best one--can be a wagering angle. But there has been some backlash in recent years. Belief in numbers is stronger than ever, but how to use them is still a source of great conjecture. E.g., a 100 Brisnet Speed Rating or a negative number on ThoroGraph is nearly universally accepted as a fast performance, but the bounce theory has its doubters. Another issue--which is in play with tracks like Keeneland--is the effectiveness of speed or performance numbers on synthetic tracks or turf courses. Fast is as fast does, but is Forrest as quick on Polytrack as he is on dirt? As always, the answer is it depends. For me, the two primary things the answer depends on are the horse's odds and what ALL-Ways calls the GAP of the angle. That is, the difference between competitors on what you're assessing (e.g. a 90 Speed Rating versus an 85 is a GAP of 5). If one horse has a last-out Speed Rating of 85 and three others have an 84 and the rest of the field is below 80 then I'm more likely to prefer the longest priced horse of the four in the 84-85 range than bet the 85 just because it's highest. On the other hand, I'd have no problem taking 2-to-1 (assuming all other factors look in line with the scope of the race) on the 85 if no one else is in the 80s. The results support the strength of this "angle." In 2013, there were 11 non-maiden Polytrack sprints at Keeneland in which a horse had at least a 7-point gap as the leading last-out Speed Rating, and six of those horses won for a positive ROI of 48%! Yes, that's a small sample, but opening it up to my whole database shows 228 main track (dirt or synthetic) non-maiden sprints in which there was at least a 7-point GAP advantage with 40% winners and a +2% ROI. None of the other 86 angles ALL-Ways analyzes comes close to that success. Using software to help handicap (and/or analyze results) can be a lot of fun for the number cruncher, but you don't need to spend hours with data to come up with a common sense approach to making your handicapping more efficient. Regardless, definitely *do* spend time with the old masters (and their words) such as the aforementioned Ragozin and Beyer books as well the others listed at Hello Race Fans. When it comes to handicapping, re-learning something you already knew can be just as valuable as learning something new.